A new study suggests high doses of B vitamins may halve the rate of brain shrinkage in older people experiencing some of the warning signs of Alzheimer's disease. Brain shrinkage is one of the symptoms of mild cognitive impairment, which often leads to dementia. Researchers say this could be the first step towards finding a way to delay the onset of Alzheimer's. Experts said the findings were important but more research was needed. The study, published in the journal Public Library of Science One, looked at 168 elderly people experiencing levels of mental decline known as mild cognitive impairment. This condition, marked by mild memory lapses and language problems, is beyond what can be explained by normal ageing and can be a precursor to Alzheimer's and other forms of dementia. Half of the volunteers were given a daily tablet containing levels of the B vitamins folate, B6 and B12 well above the recommended daily amount. The other half were given a placebo. After two years, the rate at which their brains had shrunk was measured. The average brain shrinks at a rate of 0.5% a year after the age of 60. The brains of those with mild cognitive impairment shrink twice as fast. 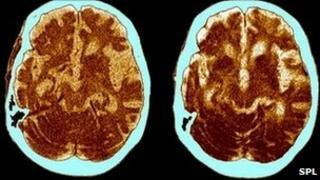 Alzheimer's patients have brain shrinkage of 2.5% a year. The team, from the Oxford Project to investigate Memory and Ageing (Optima), found that on average, in those taking vitamin supplements, brain shrinkage slowed by 30%. Media captionJohn Hough: "You become more forgetful and annoyed with yourself"
In some cases it slowed by more than 50%, making their brain atrophy no worse than that of people without cognitive impairment. Certain B vitamins - folic acid, vitamin B6 and B12 - control levels of a substance known as homocysteine in the blood. High levels of homocysteine are associated with faster brain shrinkage and Alzheimer's disease. The study authors believe it was the B vitamins' effect on levels of homocysteine that helped slow the rate of brain shrinkage. The study author, Professor David Smith, said the results were more significant than he had expected. "It's a bigger effect than anyone could have predicted," he said, "and it's telling us something biological. "These vitamins are doing something to the brain structure - they're protecting it, and that's very important because we need to protect the brain to prevent Alzheimer's." He said more research was now needed to see whether high doses of B vitamins actually prevented the development of Alzheimer's in people with mild cognitive impairment. The Alzheimer's Research Trust, which co-funded the study, also called for further investigation. "These are very important results, with B vitamins now showing a prospect of protecting some people from Alzheimer's in old age," said chief executive Rebecca Wood. "The strong findings must inspire an expanded trial to follow people expected to develop Alzheimer's." B vitamins are found naturally in many foods, including meat, fish, eggs and green vegetables. Experts are warning people not to start taking very high levels of vitamin supplements without medical advice. Chris Kennard, chair of the Medical Research Council's Neurosciences and Mental Health Board, said: "We must be cautious when recommending supplements like vitamin B as there are separate health risks if taken in too high doses. "Further research is required before we can recommend the supplement as a treatment for neurodegenerative diseases, such as Alzheimer's." The UK's Food Standards Agency says taking more than 200 milligrams a day of vitamin B6 can lead to a loss of feeling in the arms and legs, but these symptoms are reversible once someone stops taking the supplements. It adds that taking 2mg or less of vitamin B12 supplements a day is unlikely to cause harm, but that there is not enough evidence to know what the effects of taking more than that would be. Taking too much folic acid - over 1mg a day - can mask signs of vitamin B12 deficiency. An early symptom of B12 deficiency is anaemia, but taking large amounts of folic acid treats the anaemia without treating the B12 deficiency.